Remington is voluntarily recalling Remington Model 887 shotguns manufactured from December 1, 2013 to November 24, 2014. Remington has determined that some Remington Model 887 shotguns manufactured between December 19, 2013 and November 24, 2014 may exhibit a defect causing the firing pin to bind in the forward position within the bolt, which can result in an unintentional discharge when chambering a live round. Therefore, Remington is recalling ALL potentially affected products to fully inspect and repair. Remington has advised customers to immediately cease use of recalled shotguns and return them to Remington free of charge. The shotguns will be inspected, repaired, tested, and returned as soon as possible. 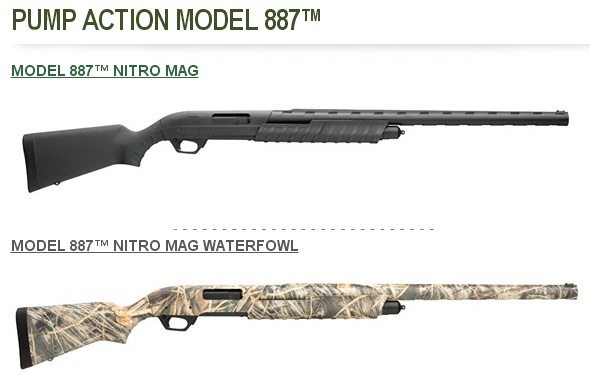 RECALLED: Remington Model 887 shotguns made from Dec. 1, 2013 to Nov. 24, 2014. Owners of the recalled shotguns should not attempt to diagnose or repair the shotguns themselves. Remington has established a dedicated website and toll-free hotline to help Model 886 owners consumers determine whether their shotguns are subject to recall. Visit 887recall.remington.com or call 1-800-243-9700. REMEDY/ACTION TO BE TAKEN: STOP USING YOUR SHOTGUN. Any unintended discharge has the potential to cause injury or death. Immediately cease use of recalled shotguns and return them to Remington free of charge. Shotguns will be inspected, repaired, tested, and returned as soon as possible, at no cost to you. DO NOT attempt to diagnose or repair recalled shotguns yourself. For your safety, STOP USING YOUR SHOTGUN and immediately contact Remington. Share the post "Remington Recalls Recently-Made Model 887 Shotguns"
Seems like a lot of recalls overall by Remington over the past year or so. To bad. Freedom Group- General Motors merger?